The Donald burst onto the scene, entering the 2016 presidential race as a Republican. The GOP needs to attract Hispanic voters to win the White House. So first, The Donald attacked immigration from Mexico. He implied that all immigrants were rapists. All illegals should be deported. Never mind the $165 billion estimated cost of deportation. Having “Anchor Babies”, a term used to describe a technique whereby the parents can stay in the US when they have a child born in the US, should be illegal. If the 14th Amendment guarantees citizenship to those born on US soil, this will be changed, and never mind the 2/3 of Congress and the 2/2 of the States needed to ratify a change. The fence to keep illegals out? He’ll get that built and make Mexico pay for it. Trust Trump, all this improbable stuff will happen. His poll numbers immediately shot up, leading the pack. The U.S. already has in place more than 650 miles of border fencing. That project was estimated to have cost $2.4 billion in 2009 and will continue to cost billions to maintain. But Trump's plan calls for a better border fence. 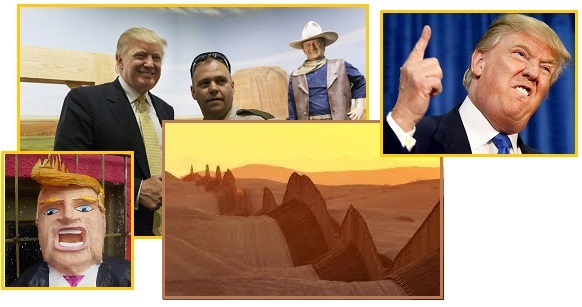 Assuming the existing fence is scrapped and replaced with one as secure as Israel's security barricade meant to deter terrorists, the cost of building a fence along all 1,989 miles of the southern border would come to more than $6 billion. National Journal once estimated it would cost $6.4 billion when all is said and done. The Center for American Progress, a liberal think tank, estimated in 2010 (when the illegal population was smaller) that it would take $200 billion to "arrest, detain, legally process and transport the undocumented population over a five year period." That did not include the $85 billion it tallied for keeping up with enforcement in the subsequent five years. 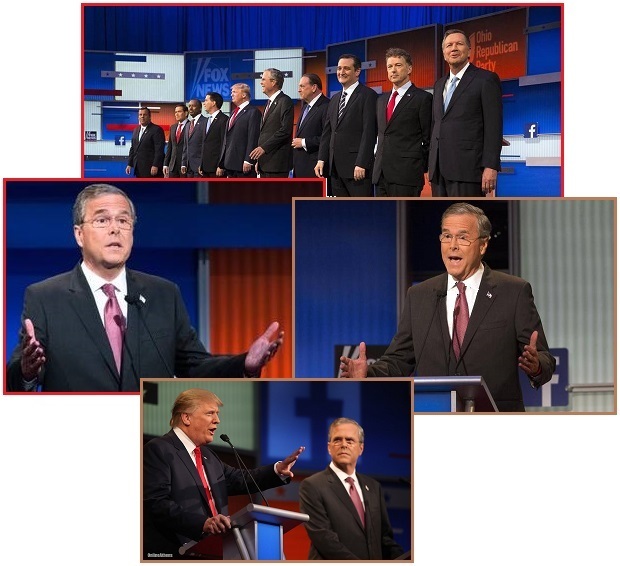 During the Fox debate, The Donald was center stage, having polled almost twice as much as any other candidate. 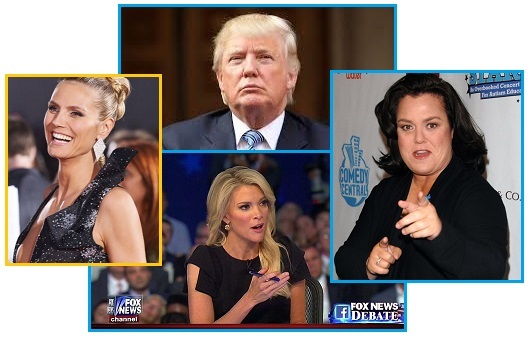 Despite the fact that the GOP feels they cannot win without the woman’s vote, being on the wrong side of the abortion issue and equal pay for women, The Donald promptly insulted the host, Megan Kelly. He implied that she was testy with him because she was having her period. Then he acknowledged his former insulting statements about Rosie O’Donnell. His poll numbers rose yet again, even among women. Then he continued with his misogynist theme by openly rating women as a 10 or less than a 10. Trump derided Kelly's job as a moderator and said, "You could see there was blood coming out of her eyes, blood coming out of her — whatever." Trump said it wasn't a reference to menstruation, as many have alleged. Heidi Klum Slams Donald Trump's Sexist Ranking Comment: "Every Woman Is a 10"
The model turned Project Runway host is speaking out about the presidential candidate's comments about her in a recent New York Times interview, in which he said, "Sadly, she is no longer a 10." Having trashed the GOP on the Hispanic and women’s vote, he was not about to leave other politicians alone. John McCaine, long revered and honored as a war hero because he refused early release until his fellow prisoners were released, and due to his permanent torture injuries, was insulted. He was, per The Donald, just a loser, coasting passively while talking hawkish. Politicians can be bought, said The Donald, and he had bought not only Clinton in the past but everyone else on the debate stage with him. Soon the other GOP candidates, desperate to rise in the polls, were on board with trashing the 14th Amendment. Almost half the field quickly announced they were on board with the plan. 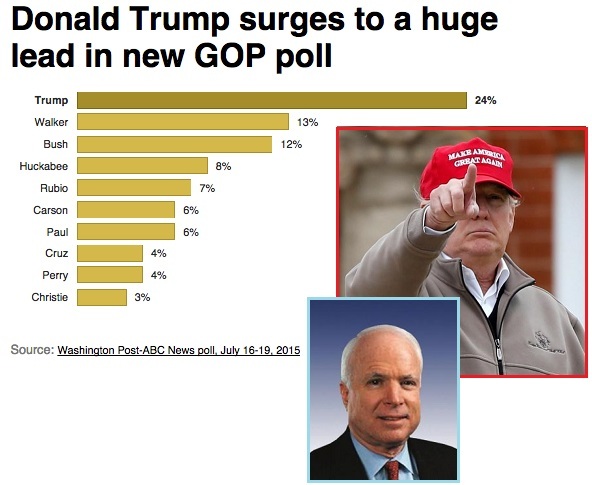 Was The Donald leading the GOP pack off a cliff? His poll numbers continued to climb. What is Trump’s agenda? The Zetas explain. "If Hilary Clinton can't satisfy her husband, what makes her think she can satisfy America?" "Rick Perry, I don’t think even understands what he is saying." "I would bomb the hell out of those oilfields. I wouldn't send many troops because you won't need 'em by the time I'm finished." ZetaTalk Insight 8/22/2015: There has been a concerted push to get either Hillary or Jeb elected, the two “legacy” families. As we have stated, both the Clinton and Bush families were well aware of the theft of Gold from Fort Knox, and those in on the theft want this secret guarded until the Last Weeks. With bank failures increasingly likely and demands for Gold to be delivered to creditor countries, this secret is likely to rupture into the news in the near future. Trump’s backers feel that rather than bank instability, prosecution of the thieves should be the outcome. Thus both the ambitious Hillary, with friends on Wall Street and a daughter married to a Hedge Fund founder, and the reluctant Jeb are being pushed by the same backers – those who stole the Gold from Fort Knox. Trump is not a serious candidate but is in the game at the request of those concerned about the outcome of the 2016 elections. Trump is neither Republican or Democrat, as his past has shown. His campaign is extremely clever, asserting policy that would be attractive enough to a large swath of those who vote Republican so that his polls are frightening the GOP. Thus the GOP cannot openly rebuff him for fear he will go Independent, ruining the GOP’s chances. Meanwhile, he is doing just that, by pointing out the bold-faced truth about all the other contenders. Candidates can be bought (but not he). Trump is also embracing embarrassing policy of the GOP, forcing the other candidates to follow his lead or lose media attention. The GOP needs the Hispanic vote, yet is anti-immigrant to its core. War mongers within the GOP shout this rhetoric but take no action, as the majority of the public does not want to go back into the Middle East, yet Trump is laying out action plans. All this forces the GOP candidates to shout more and more extreme rhetoric, which may attract a sizeable segment of the Republican voters but would be rejected by the majority of Americans. Trump will stay in the race long enough to destroy the GOP, even to the point of becoming the Republican nominee, knowing he could not win the general election. If Hillary persists he will turn his attention there, saying things about the darling of the liberal media that the media would not dare say. Is Hillary a lesbian? Trump’s backers want the crowd who stole the Gold from Fort Knox and who got the US into wars in the Middle East to be blocked and exposed. These are battles far from the public’s eyes, battles the public is unaware of, behind the scenes. We predict that neither Hillary nor Jeb will be the nominee, thus. Meanwhile, The Donald is having great fun. The Internet has been abuzz with rumors of the End of the World, all converging on the last week of September. 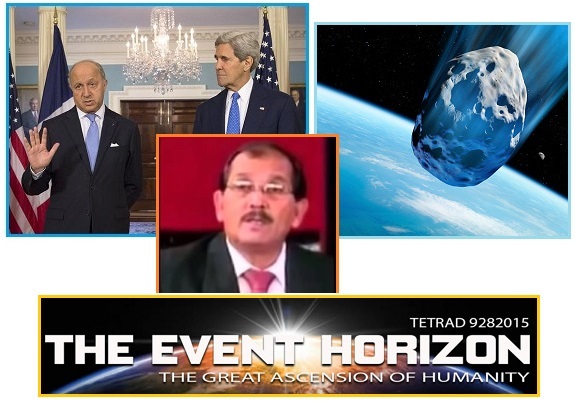 Humanity will be raptured, an asteroid will strike near Puerto Rico, and the “500 days” slip of the tongue by French Foreign Minister Fabius on May 13, 2014 surely points to this time period. Or so the rumors would have you believe. Dear Earthlings, stop worrying about an asteroid collision in September. That's the message from NASA, which countered a viral rumor Wednesday with a news release. NASA detects, tracks and characterizes asteroids and comets passing 30 million miles of Earth using both ground- and space-based telescopes. The Near-Earth Object Observations Program, commonly called "Spaceguard," discovers these objects, characterizes the physical nature of a subset of them, and predicts their paths to determine if any could be potentially hazardous to our planet. There are no known credible impact threats to date -- only the continuous and harmless infall of meteoroids, tiny asteroids that burn up in the atmosphere. In response to a rumor that has gone viral around the world, the US space agency has insisted claims that an asteroid will hit the Earth in September have 'no scientific basis'. The predictions were first made by an online community of biblical theorists who claimed the space rock will hit sometime between 15 and 28 September. Internet rumors based on a 2010 prophecy by a self-proclaimed prophet have predicated an asteroid will hit the ocean near Puerto Rico in September. According to its Near-Earth Object Observations Program, which scans the skies for potential threats, there are no asteroids or comets that could impact the Earth anytime in the 'foreseeable future. In fact, of all known potentially hazardous asteroids, there is a 0.01 per cent chance one of them will impact Earth in the next 100 years. Following a series of warnings from doomsday prophets, there is increasing convergence of opinion among believers that an asteroid apocalypse will occur in September, 2015. The growing mass hysteria appears to have originated with a self proclaimed “prophet,” Rev. Efrain Rodriguez, who claimed he sent a letter to NASA on Nov. 12, 2010, titled “Letter to the Space Agency… meteor heading toward Puerto Rico.” In the letter, he claimed he had received a message from God that an asteroid that would “soon be seen in the alarm systems of NASA” was approaching. He said the asteroid would hit the ocean near Puerto Rico and cause a massive earthquake and tsunami that would devastate the East Coat of the U.S., Mexico, Central, and South America. With the conspiracy theory community looking out for “signs” of the impending catastrophe, the statement by the French Foreign Minister Laurent Fabius, in May, 2014, that the world had only “500 days to avoid climate chaos” was interpreted widely as a veiled asteroid impact disclosure statement. Soon enough, a full blown end-time prophetic statement that originated from a number of sources in the end-time conspiracy theory community had identified September 23-24, 2015, as the asteroid impact apocalypse day. The prediction was directly inspired by Fabius’s purported “veiled warning” that the asteroid apocalypse would occur in about 500 days. A number of “prophets” had simply grabbed their calculators and with the help of a calendar, and an estimate of 500 days to the apocalypse, determined that the asteroid impact would occur around the time of on the Jewish Day of Atonement in 2015, that is, on September 23-24, 2015. A self-proclaimed prophet, Efrain Rodriguez, with zero accuracy prediction claiming in 2010 that an asteroid would hit the Atlantic and swamp the East Coast and Puerto Rico. No date for this disaster was given. Nothing has been heard from Rodriguez since. French Foreign Minister Laurent Fabius mumbling something on May 13, 2014 about “500 days”, which computes to September 23-24, 2015. As we explained, the 500 days was the number of days agreed to by Xi and Obama when they met in California re the announcement plans, not the date of the presser with Kerry where Fabius made the slip of the tongue. A self-proclaimed channel claiming that 1/3 of humanity will ascend on September 28, 2015. The 2015 Jewish Day of Atonement occurs on September 23-24, 2015. 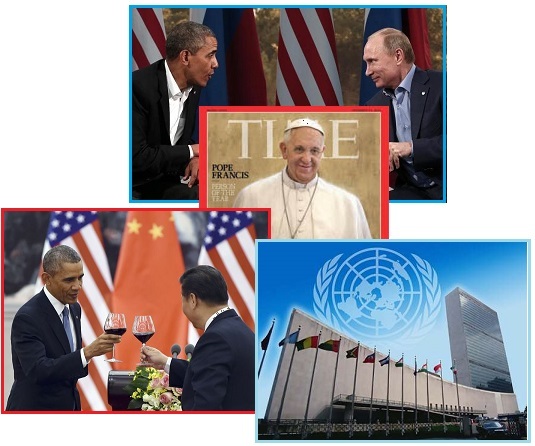 The Pope is coming to New York City to address the UN on September 23, 2015. All this was rolled into a pie and baked on the Internet. By whom, and why? NASA periodically talks about Near Earth Orbit (NEO) asteroids and their plans for defense, and have brought this down on themselves thus. In the past they have used asteroids as a cover for the debris in the tail of Planet X, aka Nibiru, and in step with the tenacious cover-up over the pending passage of Nibiru, were not about to tell the truth. Now the announcement is pending, perhaps even scheduled for late September, and the asteroid fear mongering is being used against NASA. 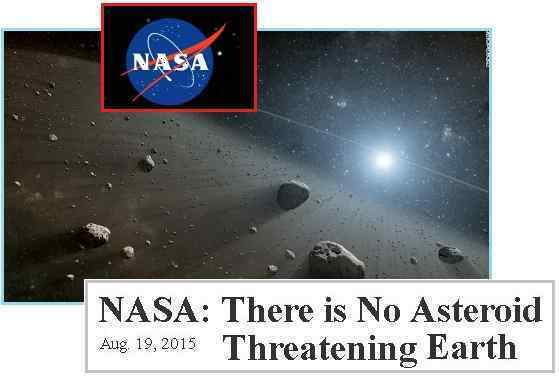 The people actively promoting the September 23 asteroid rumors seek to cloud the announcement over a legitimate threat – Nibiru’s pending passage – with this nonsense. No asteroid will strike nor pass close, and they hope that by confusing an asteroid threat with Nibiru itself, that the announcement will be belittled and cast aside. Oh, that, the public will say, it was only an asteroid hit that did not occur. Thus the real threat, which the public should take seriously, will be ignored. The group pushing this disinformation is identical to the cover-up crowd. This group wants the public to remain ignorant until the end for the convenience of the elite. Why would the cover-up crowd think that the announcement is going to happen during the last week of September? Let us count the clues. Pope Francis is going to address the UN in New York City on September 23. Putin is rumored to be attending also on that date. China’s Premiere Xi is meeting with Obama at the White House for a state dinner and will be at the UN on September 28. Since Obama’s partners on the announcement include Putin and Xi, might this be an announcement of the announcement date in some way? The meeting with the president and first lady will take place on Wednesday, Sept. 23, apparently near the start of a visit — the first to the U.S. by the Argentine pope — that will take Francis from the U.S. Capitol to New York and the United Nations and will conclude with a huge outdoor Mass in Philadelphia. Russia's Putin would Consider Meeting Obama at U.N.
Russian President Vladimir Putin will attend next month's U.N. General Assembly in New York. Obama invites Chinese President to State Visit in Sept.
Chinese President Xi Jinping will visit the United States in September to appear at the United Nations and attend a state dinner with President Obama. While initial state media reports did not mention the UN celebrations, they appear now to be presented as the main purpose of Xi's visit, also noting that Xi will be making a key speech at the events in New York on September 28. What else is happening at the end of September? There is the 2016 campaign, which has been waiting for VP Biden to make his decision on whether to jump in or not. He has been stating for months that he will make his decision “by the end of Summer”, which sounded like late August until his campaign staff clarified that end of Summer meant “September” and now we hear that the last day of Summer is September 22, and that his decision might even be pushed into October. What if the announcement were to happen, at the UN, during the last week of September? Obama, Xi, and Putin on hand to add weight. The Pope on hand to put the right spiritual perspective on it, and perhaps to admit that the Vatican has known about Nibiru all along. This then might be followed by an Executive Order from Obama delaying the 2016 elections for a few months, as was the speculation in Issue 463 after Obama’s chatter about a Third Term. This would account for Biden’s delays, until after the announcement, so he could reserve his energies to helping Obama post announcement. Perhaps all this is known by the GOP, which would account for Jeb Bush’s odd slip of the tongue during the first GOP debate. What did he mean, “whenever” you get to vote? I humbly ask for your vote, whenever you're gonna get to vote, whenever the primary is. ZetaTalk Observation 8/1/2015: What is Obama hinting at? Obama made a statement during a speech to the African Union on July 27 that alluded to a third term. This was in the context of discussing African presidents who refused to step aside when their terms had completed, but he was clearly hinting. Might Obama delay or cancel the 2016 elections and continue, under some kind of Executive Order, into what would be called a third term? Then there was the Executive Order joke on Jon Stewart’s show on July 21, implying he could reach outside of normal government actions via his Executive Orders, requiring Jon to continue his show and not retire. Put all this together and it is a pretty strong hint of what is to come!